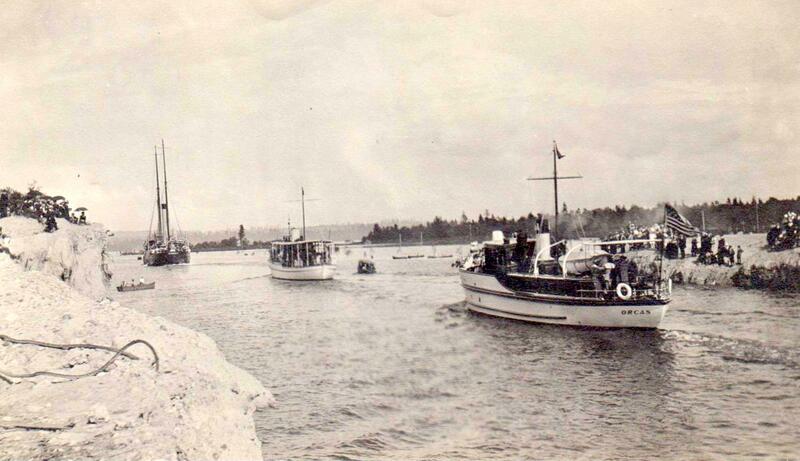 The picture above shows the parade of boats as they navigate the ship canal into Lake Washington and back to the Sound on July 4, 1917. The locks had actually been in operation for several months by this date but it was decided to have a grand celebration to commemorate a project that required decades of planning and 5 years of hard work to complete. Every July 4 features celebrations of the anniversary of America's Independence and this day was even more memorable by the locks official opening, coming as it did only months after the U.S entered World War l. The navy had originally planned to build a base at this location and the locks were to be an integral part of this decision. The day featured military parades in downtown Seattle, swearing in ceremonies for new citizens and music and entertainment all around the city. 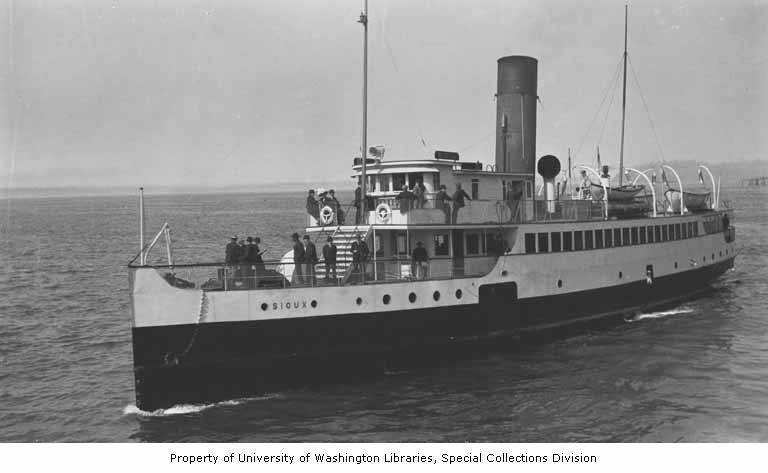 The Roosevelt was to be the first “official” vessel to make the journey from Puget Sound to inland lakes and back out to the Sound again, accompanied on this day by more than 200 parade vessels, and joined afterwards by Seattle-ites with anything and everything that would float. Tickets were available which would allow interested parties to be a part of the procession. The image to the left is of an ad from the Seattle Daily Times offering passage on the steamer Sioux as part of the parade. The price was $1.00 which was not an insignificant sum in those days. At least one ad from this year referred to a Union Mechanic's wages as $8.00 per day. 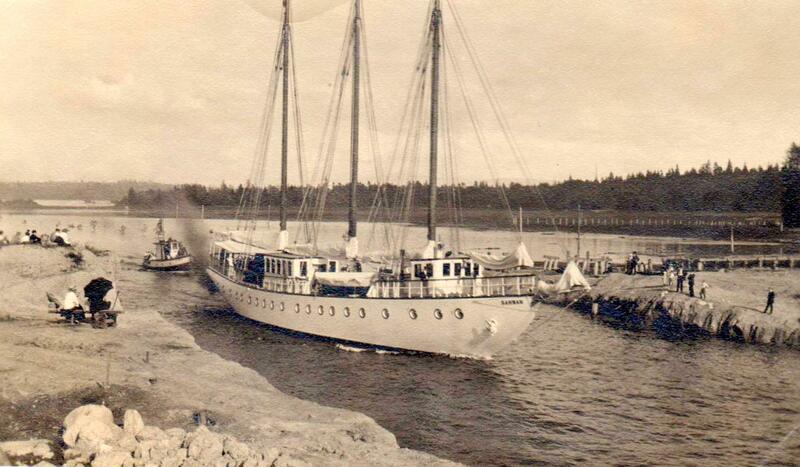 According to Newell, ed., McCurdy Marine History, the Sioux was the first commercial vessel to pass through the locks during the opening ceremony on July 4, 1917. On the right is a picture of the Sioux taken several years before. 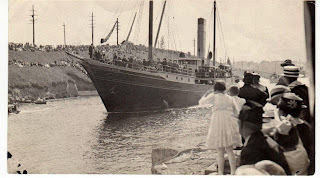 It was built by the Moran Co. in 1910 and its founder Robert Moran will be mentioned later in this article as he was a strong supporter of the Locks project and a local dignitary. The Locks celebration started in downtown Ballard with a parade headed by the Ballard Boosters starting at 1:15 pm and proceeding to the Government Locks (the official name at the time). After arrival, there would be a concert by the Seattle City Band, speeches by Col. Cavanaugh, Capt.Coontz, Maj. Dent and several judges. A street carnival and rose show would follow. The water parade would begin at 2:30 pm with the Roosevelt being the first "official" ocean going ship to make the inland journey into Lake Union and Lake Washington. Then to end the evening there would be prizes awarded for the rose entries and a dance starting at 9:00 pm. The Roosevelt heading the parade. The Roosevelt was in fact the ship that Admiral Peary had sailed in his successful trip to reach the North Pole and so it was fitting that such a noted vessel would be selected to lead this historic event. Or perhaps it was Elmer Reed in his humble canoe who seized the moment. More on that later. With the Roosevelt in the lead a slow procession of ships, boats, tugs and just about anything which could float started up the canal to its eventual destination at Leschi Park . It was estimated that well over 100,000 people were scattered along the Ship Canal in order to witness this once-in-a-lifetime occurrence. Seattle's population at the timed was reported to be 360,000, so this represented the largest single gathering in the city so far. With the rest of the vessels in line behind the Roosevelt, the parade proceeded along the canal headed for Leschi Park. As mentioned earlier there were 200 plus official vessels in this parade and a strict and orderly distance of 150 feet was to be kept between all. It took over one hour for the entire parade to pass any specific point and this was not including all the private vessels who took to the water and joined in the celebration. 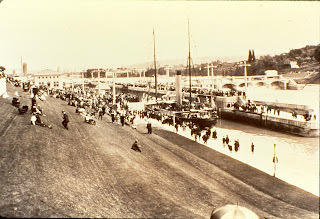 The first three boats in parade. 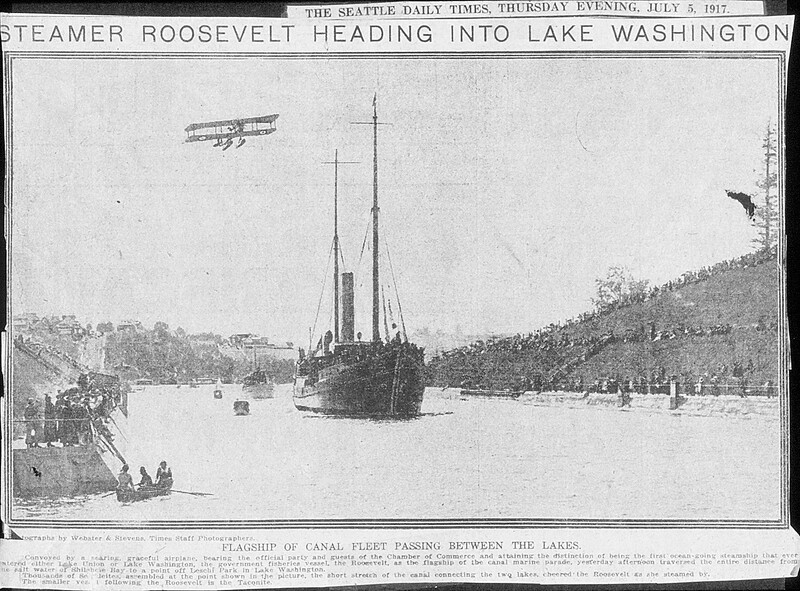 While approaching Leschi Park it was discovered that one of the government dredges used on the canal had moored at the only available pier, making it impossible for the Roosevelt to tie up along the shore. 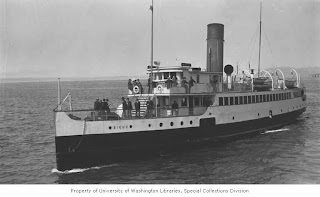 The passengers on the Roosevelt would have to be taken on tugs so as to take part in the activities on land. While heading to pick up a second load of dignitaries, one of the tugs rammed a rowboat which was carrying one Senator Landon with two other unnamed gentlemen. The Senator saw the oncoming tug and realizing a collision was inevitable abandoned the rowboat, diving headlong into the lake. According to the newspaper, "The Golden Gate (tug) carried the rowboat fully 100 feet away, but Landon swam to it and was pulled out, shedding water and maledictions impartially." A phrase worthy of Mark Twain himself. More speeches and proclamations were given and one of the earliest Boeing airplanes (the biplane in top picture) circled overhead to add to the already impressive spectacle. Another curious mention in the paper was of the female guests on board the Roosevelt. No names were given, but simply a mention that they were guests of the officers of the ship. Rank has its privileges! By now evening was at hand and it was time for the return portion of the journey. Some of the unofficial vessels in the parade dropped off along the route to take part in various activities which were taking place all over Seattle but the length of the procession was still like nothing seen before or since. Considering the number of vessels taking part in the day's events it is noteworthy the almost total absence of mishaps. But then the day was not quite over. Robert Moran, retired owner of Moran Co., successful businessman, past mayor of Seattle, and long a champion of the canal project, had been near the front of this flotilla on board his yacht Sanwan. He had retired to what has become known as Rosario Resort (in the San Juan Islands), in a mansion built to celebrate the retirement years of a very successful man. He was representing the Seattle Yacht Club, sailing his latest creation launched a year before. 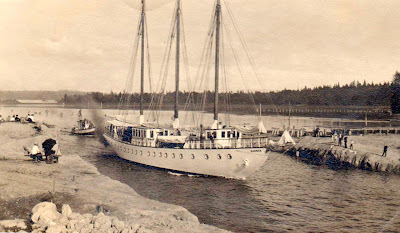 The day had been a resounding success and after completing the locks transit and heading back for his home on Orcas Island, the Sanwan ran aground approximately where 60th St NW would be. Three tugs were dispatched in an effort to free the vessel but were unsuccessful and had to wait until 2:30 am and the rising tide to do what the tugs couldn't. The evening would have the requisite fireworks and all the excitement they always bring out, but without question the singular event of this Independence Day was the parade celebrating the completion of Lake Washington Ship Canal. Succeeding anniversaries would be memorable but of course nothing compared to the first one. We will have to see what might happen in 2017, which will mark the centenary anniversary of the Chittenden Locks. Seattle Daily Times ad July 5 1917. The Roosevelt in the large Lock July 4, 1917. All photos courtesy of The United States Army Corps of Engineers except where noted. The Hiram M. Chittenden Locks (formerly The Government Locks) located in the Ballard neighborhood of Seattle, Washington is an active site managed by of the U.S. Army Corps of Engineers. July Friends’ Meeting: Tour the Locks!